The PRECISION name needs little introduction in Australia. Arguably the most successful boat building brand to come out of WA and for many good reasons. Having built hundreds of pleasure and commercial boats, "Precision" are renown for their strong, safe and stable blue water performance. Call Travis on 0419 911 560 for a viewing. The hull lines were designed by Phil Curran with a fine entry, heavily flared bow, a deep V and wide chines through to the beamy transom. It very hard not to feel a sense of satisfaction at the helm of such a beautifully designed boat with lines that are pretty much perfect and timeless. This 2000 model was one of the last few built and has been loved by only a select few owners since new. Although having been built in 2000, she was re- powered with CATERPILLAR C9 diesels in 2007. Complete with ZF gears and electric throttle and shift she manoeuvres easily in her own length with great vision from the bridge while she powers up nicely to a cruise of 24 knots and a max of around 29 knots. 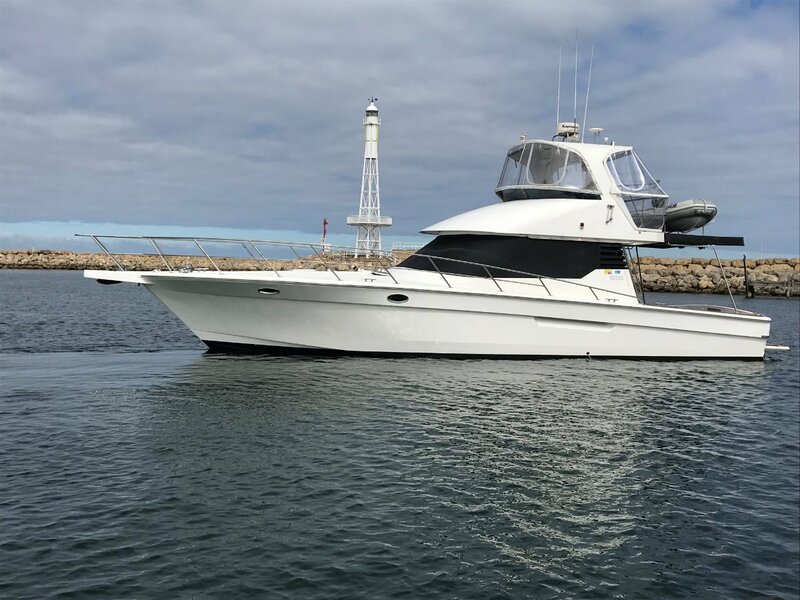 Contact Mansfield Marine, WA's Largest Pleasure Boat Brokers to arrange an inspection of this vessel. 3/. Mansfield Marine buy and sell boats all over Australia. Our vast network of brokerage alliances throughout Aus and beyond ensure that if you want to buy or sell, you are not limiting yourself to a small local broker. Often carrying around 150 Brokerage Listings and having imported more than 200 power and sail boats over the past 17 years alone we know where to get exactly what you want. We often sell boats to East Coast buyers. We dismantle and reassemble vessels and arrange trucking / shipping where required, either over east or overseas! TV/DVD and Quality stereo throughout saloon. This WA built thorougbred cruiser will help create fine memories with the family and friends, with room to move and the ability to take you to Exmouth for a month or just a day trip to Rotto.